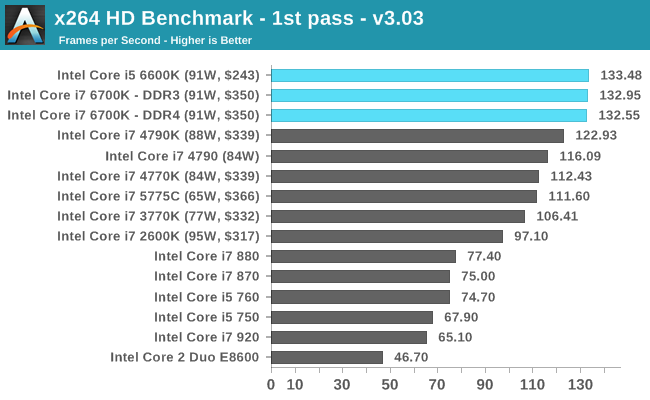 Moving on to the generational tests, and similar to our last Broadwell review I want to dedicate a few pages to specifically looking at how stock speed processors perform as Intel has released each generation. 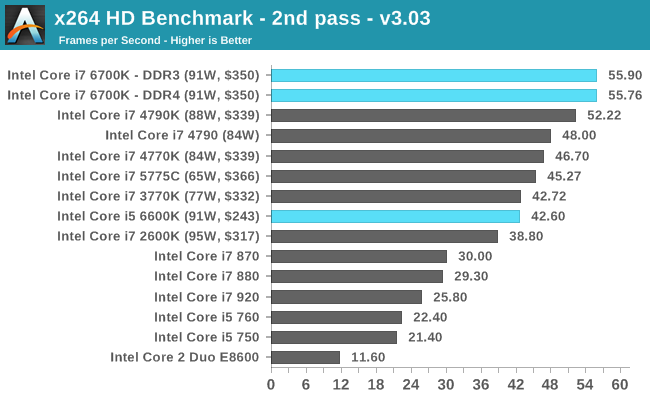 For this each CPU is left at stock, DRAM set to DDR3-1600 (or DDR4-2133 for Skylake in DDR4 mode) and we run the full line of CPU tests at our disposal. 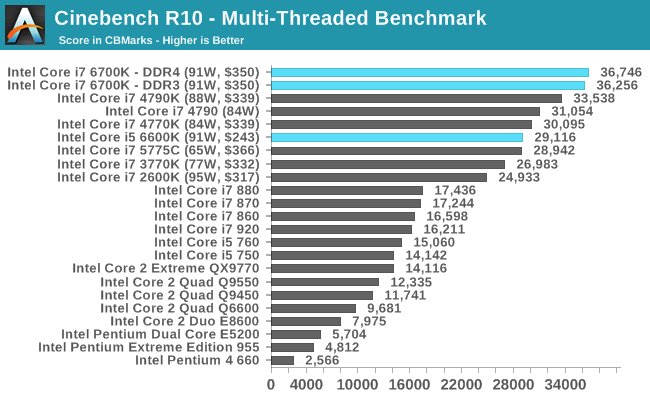 Some users will notice that in our benchmark database Bench, we keep data on the CPUs we’ve tested back over a decade and the benchmarks we were running back then. 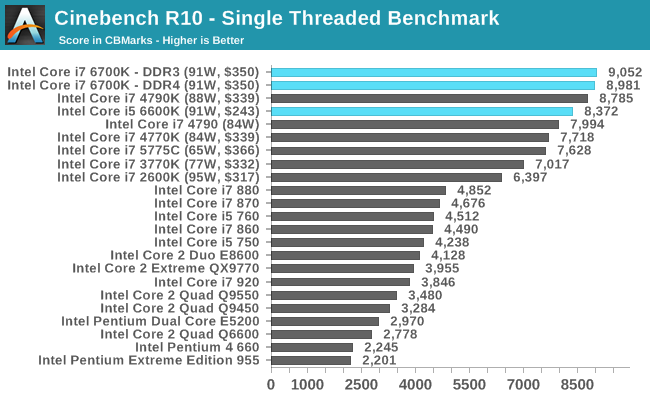 For a few of these benchmarks, such as Cinebench R10, we do actually run these on the new CPUs as well, although for the sake of brevity and relevance we tend not to put this data in the review. Well here are a few of those numbers too. 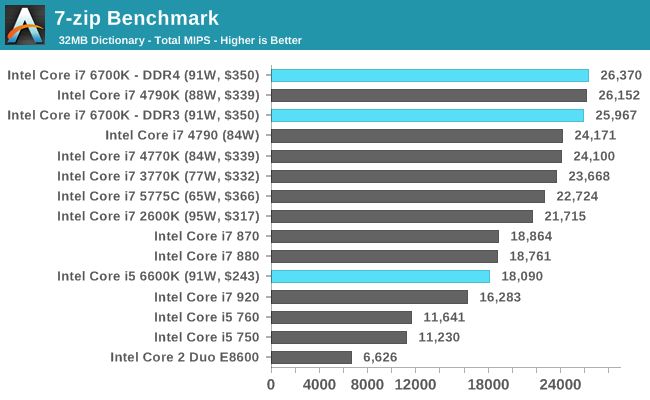 Even with the older tests that might not include any new instruction sets, the Skylake CPUs sit on top of the stack. Our WinRAR test from 2013 is updated to the latest version of WinRAR at the start of 2014. We compress a set of 2867 files across 320 folders totalling 1.52 GB in size – 95% of these files are small typical website files, and the rest (90% of the size) are small 30 second 720p videos. On the lower end processors, general usability is a big factor of experience, especially as we move into the HTML5 era of web browsing. For our web benchmarks, we take four well known tests with Chrome 35 as a consistent browser.